Made of Steel, Resin, Stands with or without wheels. We have your umbrella holder. 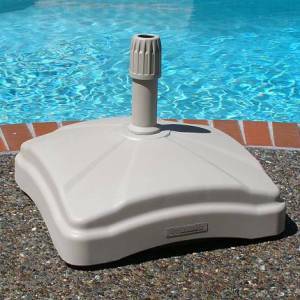 While there are many components of a quality patio umbrella, we feel the most important is the umbrella stand or umbrella base, and knowing the difference. 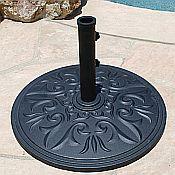 Choosing the correct umbrella stand or base for your needs is important. It provides appropriate amount of support for your umbrella, the stand should be the proper size and weight regardless of your designing desires. 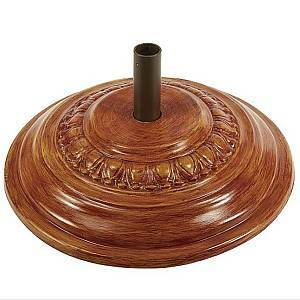 Do you have a table with an umbrella hole and need an umbrella base? Do you need a free-standing umbrella stand? 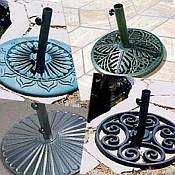 We have several styles of umbrella stands, made of heavy-duty materials that will suit your needs for support and style. What is the difference between and Umbrella Stand vs Umbrella Base? 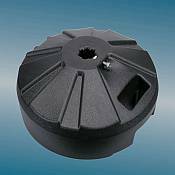 Umbrella Stand - Is a heavy weight to hold to insert bottom of part of pole to hold the umbrella upright in a free standing position. 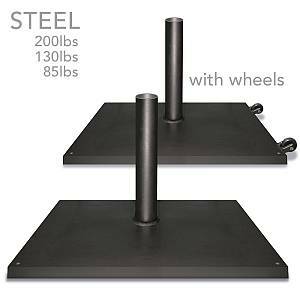 In general, 50lbs or more are inteded as free standing bases. The heavier it is, the more stable the free standing umbrella will be. 20-29 lbs 6ft umbrellas or smaller in a table. 30-39 lbs 7.5ft umbrellas or smaller in a table. 40+ lbs 9-13ft umbrellas ALSO supported by table. 50-69 lbs Up to a 6ft umbrella. 70-89 lbs Up to a 7.5ft umbrellas. 90+ lbs 9 - 10 ft umbrellas. 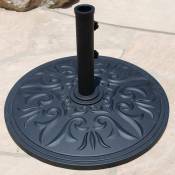 Umbrella bases come in a wide variety of sizes and weights. 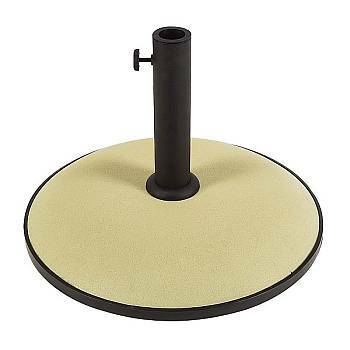 Bases and stands that weigh between 20-45lbs are usually intended for umbrellas that are used through a hole in middle of a table. The table and the base work together to provide adequate support for the umbrella. 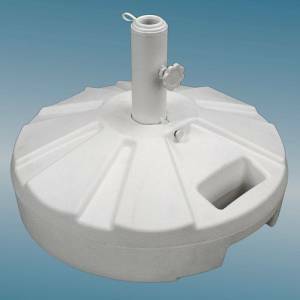 The base also prevents the umbrella from blowing away on windy days. 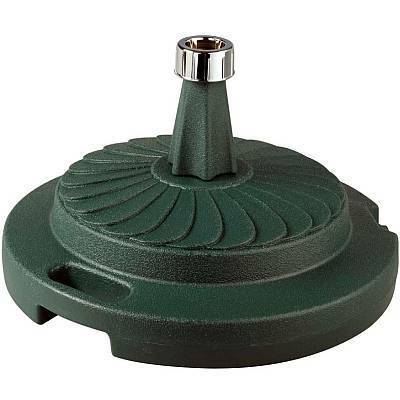 Umbrella bases and stands that weigh 50lbs or more are usually intended for free-standing umbrellas that do not have additional support from an umbrella table. 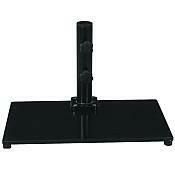 These heavier stands have a longer stem or taller tube that holds the bottom end of pole. A typical 9 foot market umbrella requires at least a 70lb stand for mild wind conditions. 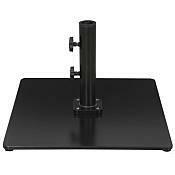 The larger your umbrella, the heavier your stand or base should be. 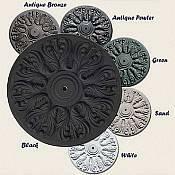 Our Umbrella Stands and Bases are made of superior quality materials and are available at discounted prices for savvy buyers. We make sure to select the best products for our customers and base our decisions on factors such as quality, design, reliability, warranty, and value.